UPDATED: APR 2, 2019 Black color with a mocha head, aroma of coffee, caramel and roasted malts, medium sweetness, medium bitterness, medium boby, medium to soft carbonation. UPDATED: MAR 31, 2019 Can. Black; a tan head fades to less than a coat. 3- Aroma of mocha, firm roast, some licorice, coconut that could almost be part of the coffee. Just medium bodied, lowish carbonation. Rather less intense taste than expected - really quite lightly flavoured. Not all that sweet with chocolate, ash, nice coffee, light caramel and a brief drying finish. Pleasant but underwhelming. UPDATED: MAR 29, 2019 Can at home. Pours very dark brown, with an intense head at the begin. Aroma is very restrained in my opinion, I mostly get some dark malts and old coffee. Light to medium body, but feels mostly a bit too light for me. Flavour could be maltier for me, it maybe is quite sweet in general but without corresponding body. Then you get a lovely balanced coffee and roast flavour that comes out, which saves this beer. Maybe some coconut, but the coffee is the dominant flavour here; Rwandan coffee somewhat noticeable, as there are some interesting hints to the coffee, some berry and spice notes. Finishes dry, quite bitter and roasty. A decent coffee porter, definitely a nice showcase of the coffee, but a bit imbalanced in my opinion. UPDATED: MAR 25, 2019 Can @Sam Beer (Rome). Nera, abbastanza densa, schiuma beige media. Al naso nota metallica che via via si attenua, emerge quindi il caffè e una leggera punta di cocco. In bocca è abbastanza ben equilibrata, attacco dolce con finale amaro caffettoso. Corpo medio, carbonazione media. Ha qualche problemino. UPDATED: MAR 24, 2019 Tried at BeerHeadz Nottingham. Deep brown to black colour with a tan head. Atoma has lots of coffee, berry hints and coconut. Taste is mid sweet and nutty. Full body. UPDATED: MAR 20, 2019 Black colour. Brown head, two fingers, good retention. Difficult to see the carbonation through the darkness. Oily texture with no fizz. Soft aroma, toasted, coffee, chocolate, creamy background. Sweet in mouth, with chocolate, caramel and coffee. No coconut to be found, at least in this batch... Soft to no bitterness at the end. Alcohol well integrated. 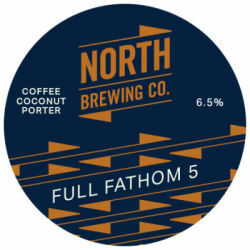 UPDATED: MAR 18, 2019 Rami Rami is drinking a Full Fathom 5 by North Brewing Co. at Powiśle Ten kokos tak umiarkowanie fajny, w sensie pachnie troche jak ta woda ze swiezego i to niedojrzalego kokosa... zaglusza chyba sympatyczna kawe, nawet jakies czeko. Calosc lekko kwaskowata, srednio ciala, chlalne calkiem, acz nic specjalnie smacznego. 3.3? UPDATED: MAR 3, 2019 Can 0.33l at home, 03.03.2019. Pour it dark color with small head. Aroma light coconut. Taste roasted malt, light coconut, medium bitterness, astringent after taste, slick, lighy body, bitter roasted asfter taste. UPDATED: FEB 9, 2019 Can. Dark brown color with white head. Aroma is chocolate, light coconut, coffee roast, though not tlo intense. Taste is chocolate, coconut, rather sweet and fatty, coffee ground again, feels quite decadent for just 6.5%. Silky mouthfeel with foamy carbonation and a coconut finish. Tasty, but I've had better in this style.